Well hello there. It’s been some time – over three months since I did a “proper” post. I know there was all that climate change stuff, eight weeks of it, but that’s not real blogging, is it? Not the flow of natter and triviality that our reader expects and enjoys. There’s a reason for that, of course. You may have seen and heard on the news that Cornwall was cut off from the rest of the world by the storms that lashed the south of England in February. The solitary railway line was destroyed at Dawlish in Devon which brought panic and isolation. We have been subsisting entirely on pasties and cider, and we were running out of those – so we’re glad the railway has been repaired now and we’re reconnected and I can blog again. A more convincing excuse might be that I’ve been busy. My involvement with WREN (Wadebridge Renewable Energy Network) has expanded from writing an occasional blog to being co-opted onto the board as communications director. So there have been communications strategy planning sessions, taking over the Twitter feed, writing press releases, reviewing and updating bits of the WREN website and attending board meetings. What do I, an accountant, know about communications? A smidgeon more than the rest of the board, is what, and time to do it in while they are busy doing other more technical stuff. Shell change management courses and project experience finally pay off! Since then, Twitter has been slightly excited, with @WRENuk getting mentions and retweets. Diana and I have also been invited onto the board of the Wadebridge Creative Hub, an organisation facilitating the arts in Wadebridge. The other members come from music and dance and painting and events, but we fly the flag for the written word (though Diana is also involved with music – something pretty much impossible for me). There’s actually a large overlap with the WREN and Spot the Dog communities (see posting of November 28th, 2013), which is kind of how we found out about it. The writing skills, not to mention my stint working on the Shell control framework a few years ago, have come in handy in drafting governance and policy documents for the Hub. One of the Hub members arranged a one-off showing in the local cinema, the Regal, of an old silent movie, Sunrise, with live musical accompaniment by a band called Wurlitza. It was actually rather good with quite modern songs being applied aptly to the old film. 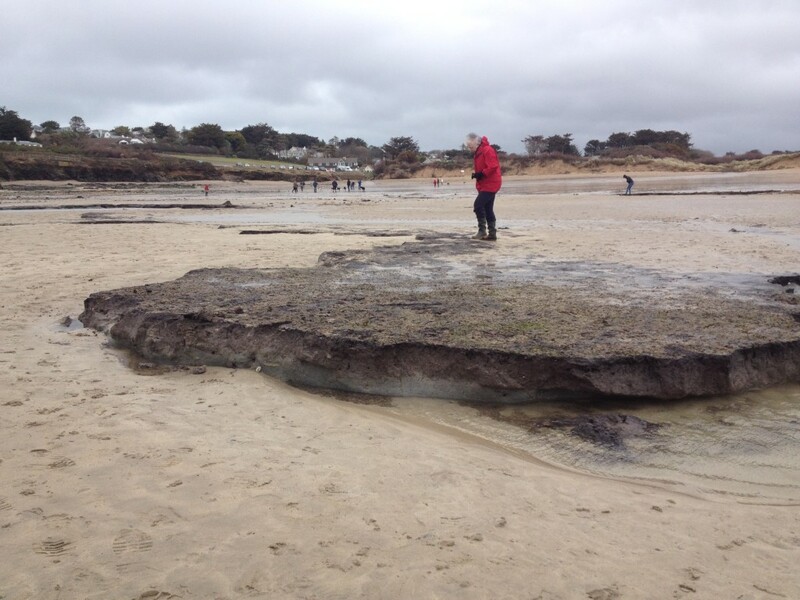 Back in March we got wind of a “petrified forest” appearing on the beach at Daymer Bay, the sand that normally buried it having been washed away. Diana and I had to see that. We went at low tide and walked along the edge of the sea, but could see nothing unusual. Then, as we turned back to the car park, we saw people gathered around a dark, rocky shelf protruding above the sand. We went over and walked on it, becoming very excited by a tree stump about a foot high. This was our petrified forest. Not as many trees as we we’d expected, but there nonetheless. Then we touched the rock shelf and it felt spongy. The petrified forest was actually flattened vegetation, compressed over many centuries, but not precisely “petrified”. The sad thing thing was that, exposed now to the sea, it was crumbling and being washed away. We’ll probably go and have a look again, but not over Easter – too many cars trying to get up and down the very narrow road to Daymer at the same time. I’ve also joined the Wadebridge Rotary Club, an organisation as different from WREN and the Creative Hub as it could be whilst still in the same town. I was formally accepted and inducted last Thursday (10th April) and on Sunday I was on the gate at the Royal Cornwall Showground collecting entrance money for a charitable money raising event to do with Cornwall’s coast and marine pastimes. Finally, the bowls club opened for the season last Saturday (12th April). Local MP Dan Rogerson came to open new facilities at the club and stayed for a sandwich. Wadebridge mayor Tony Rush bowled the first bowl of the season. This year I have entered several competitions and the first one, a singles, started on Monday (14th). I won the first round against Frank, who joined the club about the same time as me last year. In the second round, I was up against a more experienced player, Tom, and lost 21-16, after staging a magnificent but ultimately futile comeback from 20-8 down. “You made him work for it,” his wife said to me afterwards. This isn’t everything that has been going on, but I have to save something for later. Excellent – up to your usual impeccable standard. Now, where have I put my bowls gear…?